Despina Hyde, a registered dietitian at New York University’s Langone Medical Center, explains it perfectly: “Superfoods have extra-large doses of vitamins and minerals that can help us ward off diseases and live a longer, healthier life”. Another article defines the word superfood as: “A non-medical term popularized in the media to refer to foods that can have health-promoting properties such as reducing one’s risks of disease or improving any aspect of physical and emotional health”. I’ve seen firsthand that superfoods are essential for us to maintain good health. These superfoods should be consumed throughout the week and as often as possible. In today’s post, I’ll show you my favorite superfoods for weight loss and give you an example of how to incorporate each of them into your diet. But before we can move on, I want to clear up a common misconception about superfoods…they are not miracle workers on their own. Superfoods are not a quick fix and they won’t work if you’re still consuming a poor diet. For best results, eat superfoods in addition to a healthy diet and exercise plan. Otherwise, you’re only wasting your money. I know that a pound seems small, but when combined with the rest of the foods on our list, the tiny pounds quickly add up to larger amounts of weight loss. My favorite way to eat apples is dipping fresh slices into some portioned out almond butter with a little cinnamon sprinkled on top. That gives me three superfoods in one snack. From fighting depression and feelings of nausea to stabilizing blood sugar levels between meals, bananas are one powerful fruit. My favorite way to eat banana is similar to apples. Cut the banana into thin slices, add some almond butter, cinnamon, and a sprinkle of chia seeds to ward off hunger pangs and make you feel full. Thanks to the combination of fiber and water found in blueberries, they’re an excellent choice to help slim down. We’ve shown you how blueberries can target your midsection specifically in this article. Goji berries may not be as easy to find as the other items on my list, but they’re definitely worth the extra effort to find. However, my favorite attribute of goji berries is that they contain chromium, a mineral that helps control blood sugar levels and preserve lean muscle mass during weight loss. In fact, on average the placebo group saw a third the amount of weight loss compared to the fresh grapefruit group. This goes to show that grapefruit is a beneficial weight loss addition to your diet. If it’s hard for you to enjoy the tartness of fresh grapefruit slices, try blending them in your smoothies or even dropping a slice in a glass of wine. Pears are incredible for weight loss. Since pears have an average of 5.5 grams of fiber, they keep our digestive systems moving. Fiber helps our bodies absorb the nutrients and vitamins of all the other superfoods on our list. According to LiveStrong, the name pomegranate comes from Latin and translates to ‘seeded apple’. Since apples are so great for weight loss, it’s no wonder that pomegranate seeds are perfect too. I have to admit that I love oranges, but I hate orange juice. Most juices today are so packed with sugar that the true orange flavor is completely lost. In my favorite fat melting drink, I showed you why oranges are so healthy. For weight loss, the fiber and vitamin C found in oranges can’t be beat. Avocados are another favorite of mine. Once I learned about their powers I was hooked. Especially the fact that avocados help you feel satisfied after a meal. Do you ever get that feeling after you eat that you could go for something else, despite having eaten a full meal already? I used to until I learned that adding half an avocado to your lunch could prevent this issue from happening. The results showed that those who added the fresh avocado to their lunches had a decreased desire to snack between meals by 40% over the course of three hours. 28% even reported feeling this satiated (full) as long as five hours later. The combination of fiber and protein makes beans so healthy for you. Not only will black beans keep you full, but they’ll also give you a burst of energy. I like to make black bean burritos using fresh salsa, avocados, and brown rice for Meatless Mondays. Your mom was right when she told you to eat your broccoli. According to an article in LiveStrong, “eating it a few times a week can cut the number of calories you consume while promoting overall health”. That’s music to my ears. Instead of severely limiting your calories on certain diets, you can add more nutrients and cut calories simultaneously by eating broccoli. Chiles pack a punch of heat that’s been studied for its effect to help you burn calories. The capsaicin, or the ‘heat’ of the chiles, activates the brown fat in our bodies. According to an article by CBS, the more brown fat you have, the more calories you burn. According to SFGate, when it comes to weight loss, both hummus and chickpeas are super helpful. These tan colored beans are packed with soluble fiber to absorb water and give your brain the signal that it’s full. The article continues to say that chickpeas are also nutrient dense and provide you with 7 grams of protein and 22 grams of complex carbohydrates. Not only does this significant amount of protein help you build lean muscle mass to give you a slimmer, more toned appearance, but it will also help you cut calories. You could argue that all beans are superfoods, but I’ve found that black beans, kidney, and white beans are the best ones for weight loss. Kidney beans, in particular, are popular among vegetarians as a hearty meat substitute. Thanks to their iron, protein, potassium, and magnesium content, you’ll be satisfied and protected from high cholesterol. White beans have been dubbed the ‘weight loss bean’ and it’s no surprise since there’s research to back it up. According to one study, 25 participants were given either a placebo or 1000 mg of white bean extract twice a day over the course of four weeks. The participants given the white bean extract lost an average of two pounds more than the placebo group. No superfood list would be complete without including kale. But what makes kale so super? One measure, the oxygen radical absorbance capacity, takes biological samples of food and examines the amount of antioxidants in them and their ability to fight off free radicals. This test rates kale as having one of the highest amounts of antioxidants. These antioxidants can help you fight off certain cancers, but what about using kale for weight loss? How does kale help you shed pounds? According to Prevention, 3 cups of raw spinach deliver 2.9g of protein for a mere 23 calories. Although the protein content is pretty high for such a low calorie count, I’m afraid that kale has spinach beat here. The article in Prevention points out that for half that amount (1.5 cups) of kale, you’ll actually get 3.3g of protein. This is a major reason why kale has blown up in popularity. However, spinach makes up for this protein difference in another way. According to researchers at Lund University in Sweden, participants who consumed a spinach extract, which contains powerful thylakoids, showed a boost in weight loss by about 43%. Thylakoids are responsible for helping us feel satisfied and suppresses cravings for unhealthy foods. In fact, that study also showed that food cravings reported by the 38 overweight female participants dropped by 95%. Although I find it easy to add spinach to salads and smoothies, it’s actually a bit healthier when it’s cooked. The cooking process helps our bodies absorb the essential nutrients like iron, magnesium, and calcium. 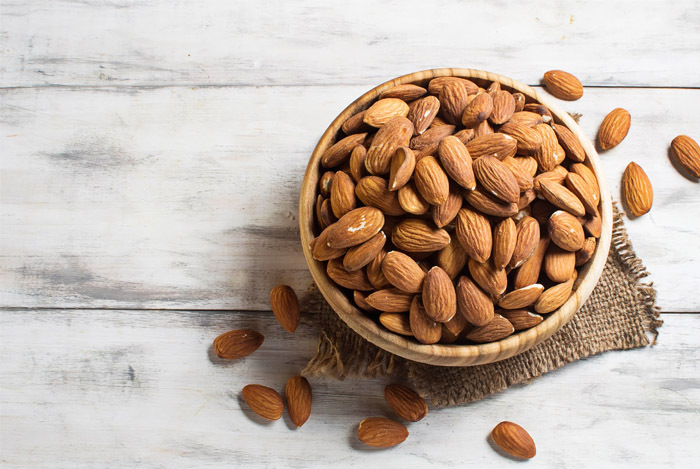 We talked about how almonds can help boost testosterone levels in this article, but they’re also ideal for weight loss. Keep a handful of almonds in your purse or at your desk and reach for them anytime a junk food craving strikes. It only takes a small amount to be satisfied. I prefer the roasted unsalted almonds. I choose almond over peanut butter any day. Almond butter offers more vitamins and mineralscompared to the old school peanut butter option. Plus, you have to be careful because many peanut butters are overly processed, almond butters aren’t. Chia seeds are one of my favorite must-have staples in the house. These tiny black seeds are awesome. I add chia seeds to my smoothies and salads as well as sprinkle them over anything involving almond butter. I even like to submerge a spoonful in water, let it sit for a few minutes while the seeds expand, and then drink it as a mid-day energy booster or pre-workout mix. Flax seeds help prevent you from overeating and give you that satisfied ‘I’m full’ feeling. According to Mercola, a key fatty acid found in pine nuts releases high amounts of cholecystokinin, an appetite suppressing hormone. Next, LiveStrong points out that: “[A] diet rich in nuts is actually linked to a leaner body composition and healthier body weight”. We talked about some of oatmeal’s health benefits in this article and if you haven’t been convinced to eat it by now, I urge you to give oatmeal another chance. Oatmeal isn’t just for breakfast; it makes a great snack between meals. Basically, the less your blood sugar spikes, the better your body feels. That’s because rapid fluctuations in blood sugar can make you feel hungry, tired, and moody. I have to admit I was a bit late to the quinoa game, but I’m certainly making up for lost time. Salmon and sardines are my top two types of fish to recommend if weight loss is your goal. According to SFGate: “A 3oz serving of wild Alaskan salmon has 155 calories, 22 grams of protein and 7 grams of fat”, making it the perfect choice for a healthy dinner. With that high protein content you won’t be tempted to snack after dinner. However, these days you should only trust wild caught salmon since farm-raised salmon has been known to create some health concerns. I praised avocado oil in this article, but I’m also a huge fan of using this superfood to aid in weight loss. Similar to chiles, cinnamon provides a great boost. That’s why I try to sneak in cinnamon wherever I can. I like to add it to oatmeal, yogurt, smoothies, and even chilli. It provides the perfect amount of flavor and just enough of a healthy kick.